CPR is not just becoming mandatory for students, but for teachers as well. 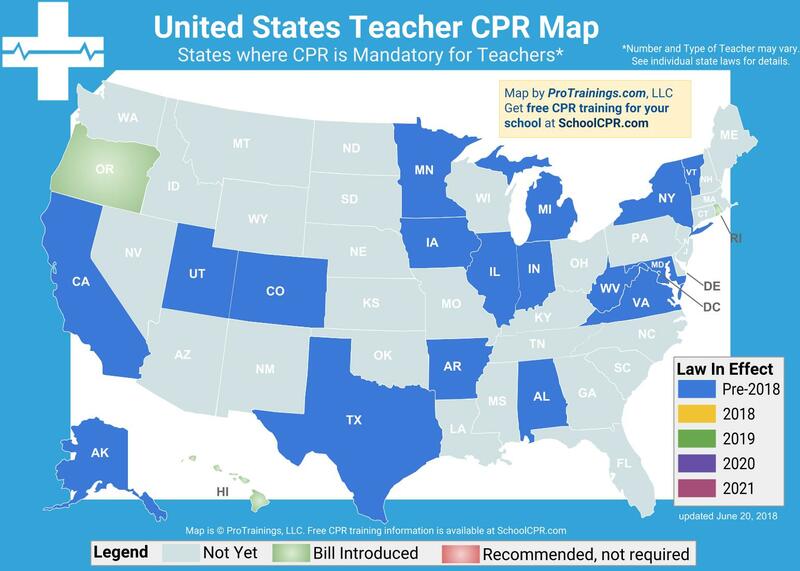 In most states where they have required teachers to know CPR and First Aid, they are adding it to the teaching certificate curriculum as part of certification or re-certification. Now that we’ve taken care of the students with our free StudentCPR program, let us assist you in getting a group quote for all the teachers in your school. Here is a map of known states where it is mandatory. The red states are clickable and have more information about the requirements in that state. Below the map is a list where you can find the rest of the states. There are bills in many states that are in various stages of implementation.